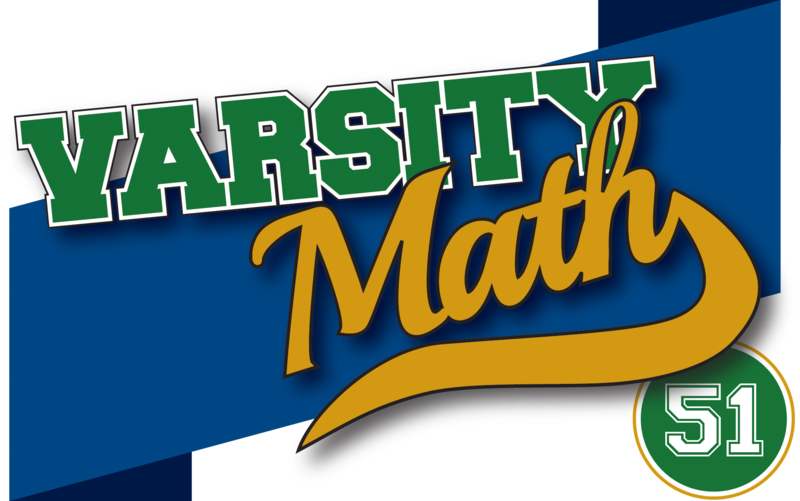 With fall quickly approaching, the Varsity Math team members are showing off their summer projects. Inspired by a terrarium in the shape of a regular pentagonal dodecahedron, Emerson has made an even more geometrically sophisticated one. 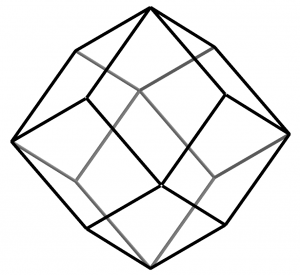 It’s in the shape of a rhombic dodecahedron, formed from twelve identical diamond shapes as shown. The long diagonal of every rhombus is √2 times the shorter diagonal, and it’s constructed so that every edge of the terrarium is exactly 5√3 centimeters long. How many liters of water would it take to fill the terrarium completely? Try Jump. The athlete has cleared 190 cm. What is the highest jump she can attempt next and still be able to ensure that she jumps her best height if she misses? Well, if she misses her next attempt she will have four jumps left but will be out on her next failure, so she will have to go back and try successive heights of 191 cm, 192 cm, etc., until she misses. That will guarantee that she attempts and succeeds at the greatest possible height she can. But with only four jumps left at that point, she can only cover heights of 191, 192, 193, and 194 cm in this way. Therefore, the greatest height she can attempt on her first jump after 190 cm is 195 cm, to still have enough jumps left to go back and “fill in” the heights she skipped, in the case that she misses 195 cm. On the other hand, if she makes 195 cm, she is in exactly the same situation as before, just with a height of 195 cm, only four jumps remaining, and two misses allowed. So the exact same reasoning tells us that the greatest height she could attempt in her next jump would be 199 cm, in order to be able to “fill in” attempts at 196, 197, and 198 cm if she misses the 199 cm attempt. Continuing in this fashion, if she makes 199 cm, her next attempt can be as high as 202 cm. If she keeps making her jumps, then she can try 204 cm, and if she makes that, on her last attempt she can try 205 cm. (If she fails at 204 cm, she has one jump left to go back and try 203 cm.) Thus, if the athlete’s personal goal is 205 cm, then she can arrange her attempts so that she will jump the greatest height she can succeed at; whereas if she set her goal at 206 cm or higher, she would at some point have to skip some intermediate height that might turn out to have been the highest jump she could have made. This is a great problem that could be extended in numerous ways. What if she had J jumps remaining, instead of 5? What if she were allowed M missed jumps instead of 2? What if the probability p(h) of succeeding at height h declined gradually above some height instead of (unrealistically) switching from 1 to 0 at a specific unknown height? If that were the case, how would the athlete maximize her expected maximum height jumped? What if she became tired after multiple jumps, decreasing p(h)? Trying out these variations will lead you into some very interesting mathematics, and as the models become more realistic, they can actually have practical consequences about how real athletes should optimize their performance in sports like high jumping. Olympic Unity. First consider two overlapping rings. How many ways can they be depicted so that they are linked to each other? They overlap at two places, so there are four depictions in all, as shown at left. In the middle two the rings are linked; in the other two, they are not. The five rings in the Olympic symbol each overlap the next in sequence, so there are four different pairs of overlapping rings. Since there are two ways to depict each pair as linked, there are two to the fourth power, or 16, ways to depict all the rings as linked together in a single chain.